Attention! Department of Food Science at the University of Massachusetts Amherst: please stand up and take a bow (and raise a toast with a healthy glass of bioactive-packed juice) to celebrate a milestone. This year marks the 100th anniversary of the nation’s first food science department. The department was founded in 1918 when UMass was known as Massachusetts Agricultural College (“Mass Aggie”). Today, the National Research Council of the National Academy of Sciences ranks the UMass food science PhD research program as number one in the country, another distinction for this award-winning department. The department’s faculty members shown below are (truly) the rock stars of food science. From the beginning, their vision as food pioneers, eminent leaders, and ground-breaking world-class researchers has allowed them to stake out the territory. Superlatives can be clichéd, but for this department, they ring true. A century after the UMass Food Science Department was created, it remains one of the world's preeminent food science programs. Numerous faculty members have been appointed to leadership roles within the National Academy of Sciences’ Institute of Medicine, as well as in the State Department. Their stated goal is to develop safer and more nutritious food to improve the health and wellness of the state, the nation and the world. If you spend time in the company of a UMass food scientist, you will quickly discover that they are passionate about everything you eat. A heady list of research studies, innovations and novel food approaches can be credited to UMass food scientists. You are not alone if you eat a delicious spinach salad, enjoy a tasty pork roast with a side of sauerkraut, or snack on a yogurt without contemplating the extensive research that may have gone into your meal. Who could have imagined in the 1950’s when infant formula became the modern feeding method of choice for Americans, that in 2017 it would be fortified with healthy Omega 3 fatty acids? Fortified formula is a big advance for infants whose parents choose this method. However, breastfeeding is recommended by many nutritionists as the preferred food delivery system, if it is feasible. When your Grandma was canning pickles in the 1960’s, did she have any idea of the health benefits of fermentation? UMass food scientists research these, and many other food choices we make every day, influencing our diets in positive ways. From its beginnings in canning classes to the industrialization of food manufacturing … up to foods for health and wellness, much has changed over a century of food science research. In the early days, the Mass. Aggie Food Science Department was established in order to research and teach food preservation techniques (motivated by critical food shortages during World War I). Today’s research focuses on diverse aspects of food including such concerns as food safety and nutritional enhancements that boost functional food efficacy. All through this history, departmental growth has responded to the needs of the times and has benefited from exceptional food scientists who have advanced been at the forefront of progress in this field. Throughout its history, the Department of Food Science has worked in partnership with the Massachusetts Agricultural Experiment Station. The Experiment Station, founded in 1882, has supported the research endeavors of faculty in this department and other food, agriculture, and environment-related departments since then, first at Mass. Agricultural College and now at UMass Amherst. Today, the Experiment Station is part of the Center for Agriculture, Food and the Environment, which brings together practical research and off-campus education in partnership with its UMass Extension unit. Today, both units, like the Department of Food Science, represent the present and future of the original Land Grant mission of the state’s public flagship university. In 1918, Walter Chenoweth, became the first department head of what was then called the Horticultural Manufacturing Department. He published the first comprehensive textbook on food preservation in 1930. Chenoweth Laboratory, home to the Food Science Department, was named in recognition of his foresight and determination. Carl Fellers was chosen as second department head in 1941. His research program had a breadth that is unheard of today covering chemistry, microbiology, nutrition and engineering. Fellers patented a process for canning and freezing shellfish that prevented discoloration and excessive grit, a process that solved two of the most serious problems of the canned shrimp industry, and an advance which constituted the greatest technical advance in 25 years. He was not only a productive faculty member but also an active member of the armed forces. During WWII, he was stationed in Australia and is credited for establishing 33 dehydration plants that provided dried milk and egg products to the troops. He was awarded the Bronze Star for this work. In 1957, William Esselen was appointed as third department head. He brought a broad research program focused on thermal processing, spore resistance, pickle technology, vitamin retention and packaging of cranberries. One of Esselen’s most important scientific contributions was establishing the time-temperature relationships of vitamin destruction using the Arrhenius equation. This pioneering research established the basis for today’s practice of utilizing high temperature-short time pasteurization to ensure food safety yet maximize nutrient retention. During Dr. Esselen’s tenure, the department experienced tremendous growth and national recognition. Jack Francis served as the fourth department head. He often wrote in support of food science and technology both in local and national publications. “We cannot feed tomorrow's population with yesterday's technology.” Francis was also quoted as saying, “Why is grain so important in world trade? Because it's nature’s way of preserving calories so we can eat them six months later.” An example of Dr. Francis’s insight occurred some work with Pfizer in the early 1960s. He was impressed with their technology and made a modest purchase of their stock. Some 40 years later, he donated $1.5 million from this investment to establish the first endowed chair in the history of the UMass Food Science Department. Herbert Hultin joined UMass Food Science after obtaining his MS and PhD from MIT in an amazing 3 years, emphasizing the ability of UMass to attract the brightest and best in the field. Dr. Hultin was considered the founding father of food biochemistry by many of his colleagues. His vision was to use the basic sciences to expand the multidisciplinary nature of food science, a concept that remains prevalent in food science research today. Charles Stumbo was one of the world’s top thermobacteriologists. He conducted ground-breaking research on methods to determine thermal processing times to ensure food safety. His book entitled “Thermobacteriology In Food Processing” contained over 250,000 food processing operations. Stumbo also developed novel sterilization operations such as ethylene oxide and vapor phase sterilization. These techniques were used by NASA to sterilize space ships to avoid terrestrial organisms from contaminating extraterrestrial life. His research decreased NASA’s sterilization time from 23 hours to 90 seconds. Fergus Clydesdale was one of the most successful teachers in the history of UMass. Along with Dr. Francis, he developed Food Science 101, “The Struggle for Food.” This class was one of the most popular courses of its time with over 1,300 students per semester, reaching an estimated 15,000 during its time. His lectures were so popular that students attended the class and took the midterms even though many were not even enrolled. Clydesdale also had an illustrious research career as he was one of the ground-breaking scientists to integrate the fields of Food Science, Nutrition and Public Policy. He was one of the leading food industry consultants providing expert advice for various projects such as one establishing the health benefits of whole grains. Clydesdale is currently the Director of the UMass Food Science Policy Alliance, the only such program in the U.S. He also gave his time to public service working with the National Academy of Science, Food and Drug Administration, International Life Sciences Institute and IFT. In 2011, The Fergus Clydesdale Foods for Health and Wellness Center opened at UMass Amherst with seven state-of-the-art research and teaching labs. Julian McClements remains one of the most highly cited scientists in the world of agriculture, according to Essential Science Indicators. During his 20 years at UMass Amherst, his work has focused on trying to understand the physical chemistry of what happens inside the body after food is consumed and how it changes as food reacts in the digestive tract. McClements’ research has resulted in new strategies to create reduced-calorie foods with the taste and mouthfeel of higher-fat foods, in an effort to fight obesity and related diseases. He has also developed nanotechnology-based approaches to develop delivery systems to encapsulate, protect, and release vitamins, nutraceuticals, antimicrobials, colors, and flavors. A number of these approaches have already been adopted in commercial food products. Eric Decker became the eight department head in 2008. As one of the world’s most highly-cited scientists in agriculture, he has already added to the stature of UMass food science. Dr. Decker is actively conducting research to characterize mechanisms of lipid oxidation, antioxidant protection of foods and the health implications of bioactive lipids. Decker has served on numerous committees for institutions such as FDA, Institute of Medicine, Institute of Food Technologist, USDA and the American Heart Association. He has received numerous recognitions for his research including awards from the American Oil Chemist Society, the Agriculture and Food Chemistry Division of ACS, the International Life Science Institute, Royal Society of Chemistry and the Institute of Food Technologist. A departmental timeline can be found here. Seeds are being sown now for a second century of progress in food science. Eric Decker says his department is very science-focused, compared to those in some other universities. This emphasis sets them apart as they work towards their goal to, “not only make foods healthier, but to also make them taste great, be convenient and a good value to the consumer. We do everything with food from when it leaves the farm until it gets to the grocery store.” When asked why they enjoy a number one ranking in PhD research, Decker quickly attributes success to their preeminent faculty. He describes them as collegial, respectful, and supportive of one another’s work. The work food scientists are undertaking these days directly affects human health, according to Decker. Did you know that food scientists are hard at work right now examining strategies to inhibit lipid oxidation, and to examine food biopolymers and colloids? Evaluating biologically-beneficial effects of conjugated linoleic acid and even assessing the genomics of beneficial microbes in your dinner are also on their (ahem) plate. What do these food-extreme terms mean for you and me? Some of this work includes the development of technologies and identification of food ingredients to improve the texture, appearance, stability and taste of foods. Other facets of their work will help decrease risks of cardiovascular and other diseases. Another area they are pursuing is the development of methods to offer “clean label” foods, that is, food without artificial additives. Work is underway to find alternatives to EDTA (a common food additive in salad dressings and mayonnaise) as well as research to find natural emulsifiers. And above all, nutritional biochemists including Hang Xiao, Yeonhwa Park, Guodong Zhang and David Sela have their lab sleeves rolled up to make our food more nutritious. The Food Safety Modernization Act (or “FSMA”) has recently brought more food safety activity directly to the farm. From that vantage point, Amanda Kinchla, Lynne McLandsborough and David Sela have conducted research to analyze and change food contamination of spinach, cantaloupe and other farm crops right at the source. Professor Lili He is developing a phone app that will allow you to detect if harmful bacteria is lurking in your chicken or spinach, instantly, check it out here. 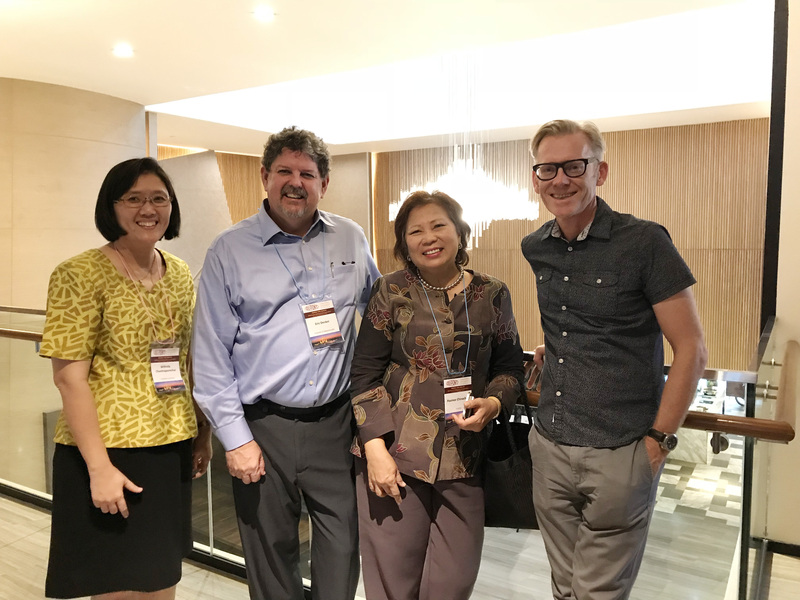 A celebration of the department’s first century was held in January at the “Foods for Health: meeting the needs of future generations,” a worldwide conference convened in Bangkok, Thailand. Department head Eric Decker said that of the 85 participants registered from the United States, Canada, Australia, southeast Asia, China, Japan and Korea, at least two-thirds were graduates of the food science department.